Hey there! In my last post, I shared that I'm updating my kitchen with a mini-face lift. I honestly do need new cabinets, or at least to repair and paint them properly. But this is a MAJOR project and one I couldn't tackle by myself, so I'm finding other little ways to spruce things up. 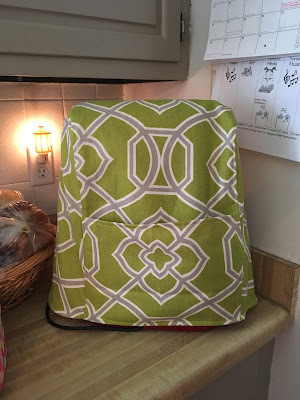 I've got lots of lime green going on and recently I made a new cover for my traditional red stand mixer. I love my mixer and when I got it, the color never mattered. It is a beautiful machine and a wonderful and worthwhile tool to have. So many uses! It should be kept covered up, so the bowl stays clean and ready for use when you are ready to cook. I had been gifted a matching red cover, and it's super nice- made of quilted fabric and has a handy pocket to keep oft used recipes in. Now with my new look, I needed to update that as well. If you guys totally LOVE this mixer cover I'll be happy to make a sewing post and show you all just how I've done it. Message me or leave me a comment and let me know if you want to see a step by step of how I made this cover. 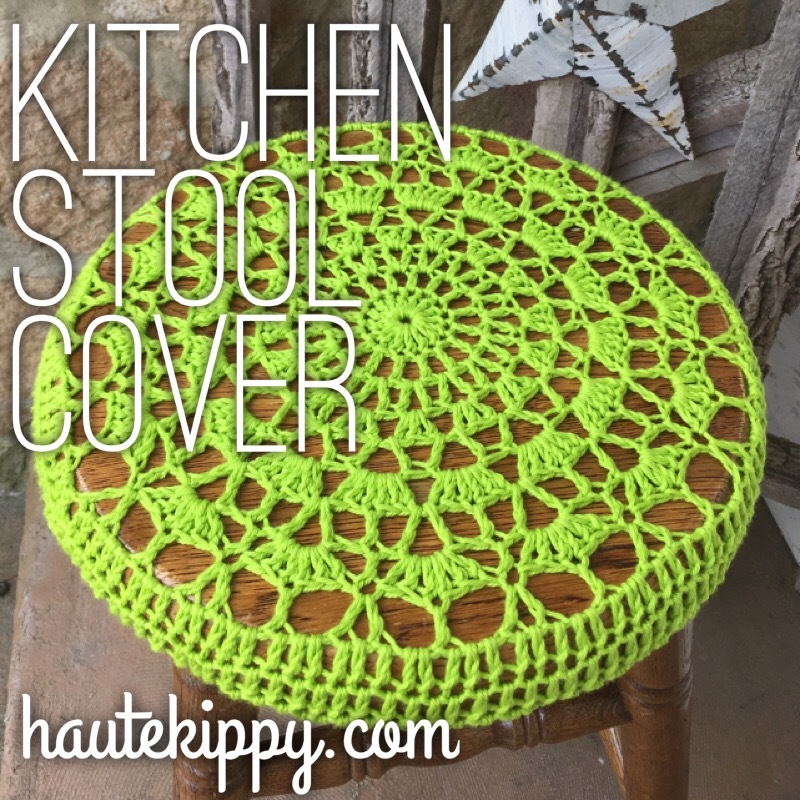 Along with this new mixer cover, I also wanted to update my stool covers. This is actually the third version I have made. I developed this pattern a long time ago, even before I started this blog! It's one I've held on to and never shared until now. I've made these in acrylic yarn but they stretch entirely too much- kitchen cotton is best. I've also tried with a magic ring for starting, but this tends to pull open after some use- starting chains are best here as well. My stools measures 13" in diameter and is around 1" thick. If your stool is comparable to this, try my pattern first then determine whether to add rounds later. 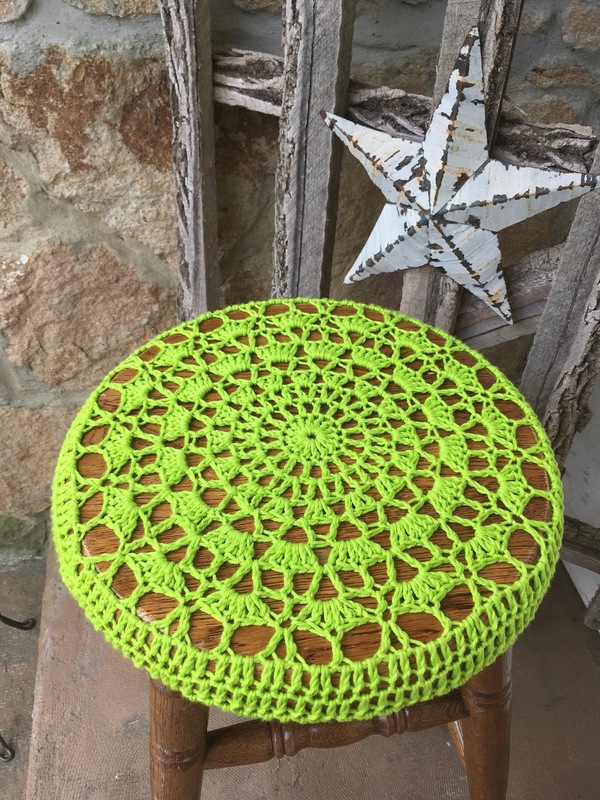 If your stool is wider or thicker, or both you may try going up one hook size, or simply add rounds to the end of the pattern- until the cover just reaches the edge of the stool. Crochet is very stretchy by nature and these will look too small at first. Notes: Created to cover stools 13” in diameter and 1” thick. There is no gauge with this pattern because the size of your stool is subjective. As is the nature of crochet, the covers are very prone to stretching. The cover will look too small at first but with some muscle will stretch to fit tightly. Eventually after some wear they will stretch out. If your stool is comparable in diameter but is thicker than 1”, try adding rnds at end of pattern (after rnd 12) to accommodate thickness. 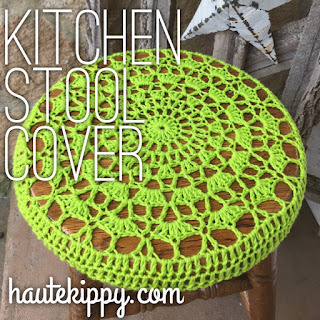 Make one cover for however many stools you have. One skein I Love This Cotton should make two covers with some leftover. Rnd 1: ch 2, make 15 dc into ring, join to first dc with a sl st.
Rnd 2: ch 4 (counts as first dc + ch 1), *dc, ch 1 into next st*, *repeat around, join to third ch of beg ch 4 with a sl st.
Rnd 3: sl st into first ch 1 sp, ch 4, dc into same ch sp (counts as first v-st), *dc, ch 1, dc into next ch sp* (v-st made), *repeat around, join to third ch of beg ch 4 with a sl st.
Rnd 4: sl st into first ch 1 sp, ch 3, make 2 dc into same ch sp (counts as first shell), *make 3 dc into next ch sp* (shell made), *repeat around, join to third ch of beg ch 3 with a sl st.
Rnd 5: sl st in each dc of the first shell, sl st into the space bet shells, ch 5, dc into the same space (counts as first lg v-st), *(dc, ch 2, dc) into the next space bet shells* (lg v-st made), *repeat around, join to third ch of beg ch 5 with a sl st.
Rnd 6: sl st into first ch 2 sp, ch 3, make 5 dc into same ch sp (counts as first lg shell), *make 6 dc into next ch sp* (lg shell made), *repeat around, join to third ch of beg ch 3 with a sl st.
Rnd 7: sl st in each of the first 3 dc of the first lg shell, ch 4 (counts as first dc + ch 1), make a lg v-st into the next space bet shells, ch 1, *dc in the fourth st of the next lg shell from the previous rnd, ch 1, lg v-st into the next space bet shells, ch 1*, *repeat around, join to third ch of beg ch 4 with a sl st.
Rnd 8: ch 3 (counts as first dc), make a lg shell in next ch 2 sp, *dc in next dc from previous rnd, make lg shell in next ch 2 sp*, *repeat around, join to third ch of beg ch 3 with a sl st.
Rnd 9: ch 5 (counts as dc + ch 2), dc in the fourth st of the next lg shell from the previous rnd, ch 2, *v-st into the next dc bet shells from the previous rnd, ch 2, dc into the fourth st of the next shell from the previous rnd, ch 2*, *repeat around to last shell, dc into the same st as beg ch 5, ch 1, join to third ch of beg ch 5 with a sl st (final v-st made). Rnd 10: ch 3 (counts as first dc), *make 2 dc in next ch 2 sp , dc in next dc, make 2 dc in ch 2 sp, dc in next dc, dc in ch sp, dc in next dc*, *repeat around to last ch 1 sp, and join to third ch of beg ch 3 with a sl st.
Rnd 12+: ch 3, make 1 dc in each st around, join to third ch of beg ch 3 with a sl st. Make more rounds to accommodate your stool if necessary, fo, weave in ends. Chain or braid a cord as long as necessary to secure the cover to the stool. Place cover on top of stool right side facing out, and turn stool upside down. Thread the cord through the last round of the cover and around each leg of the stool to keep it in place. Cinch the cord tight, and tie securely with a square knot. Tuck loose ends into cover underneath stool. If you love this pattern let me know! Share a picture of your work on Facebook or Instagram. Follow me on Pinterest or leave a comment below. If you are interested in making more fabulous accessories for your summer kitchen, visit my friends at allfreecrochet.com for more inspiration and tons of free crochet patterns to make handmade treasures for your home!